FRANKFURT - An Austria-based bank nationalized during the downturn has taken the first step toward selling a €6 billion ($8.6 billion) real-estate portfolio with the sale of a historic castle-hotel on an Alpine lake. Hypo Alpe-Adria-Bank, which has extensive holdings in southeast Europe, has signed a contract to sell Schloss Velden hotel, a 105-room luxury resort with roots stretching back more than 400 years. The new owner, Italian hotelier Ugo Barchiesi, says he plans to continue to operate the hotel as a five-star resort with a focus on medical treatments, and that he will expand its spa. The price of the deal wasnt disclosed, but hotel experts estimate it was in the € 60 million range, considerably less than the € 100 million the bank and its partner had invested in the property. The buyer and seller have an agreement not to disclose the price. The move by Hypo Alpe - Adria is the latest sign European banks are beginning to unload distressed real-estate assets. In the years immediately following the global economic collapse, they were reluctant to do so, because that would mean recording high losses. But, in recent months, some European banks have shown more of a willingness to dispose of troubled loans and seized real estate as they have stabilized their balance sheets and as commercial-property values have risen. Numerous European banks, including Barclays Capital and Anglo Irish Bank, have started to dispose of U.S. assets. Hypo Alpe-Adria was nationalized by the state of Austria in December 2009 in a bailout costing €5.5 billion. BayernLB, a public-sector German bank that itself was troubled, held a majority stake of 67%. BayernLB lost more than €3.7 billion when it handed the bank over for €1. The bank is selling off its real-estate portfolio as part of a broad restructuring effort. "The exposure of the group to real estate is by far higher than for any comparable peer," said Gottwald Kranebitter, who was appointed chief executive last year with the task of restructuring the troubled bank, which has about €40 billion in total assets. In February, the bank established a real-estate subsidiary to take on the task of selling its €6 billion portfolio, about 30% of which consists of property holdings and the rest of which is loans and leasing exposure. Most of this portfolio is in southeast Europe, and about a third is related to tourism, including hotels, camping sites and other hospitality infrastructure. Mr. Kranebitter said in an interview that the bank hopes to close on sales of about 100 properties this year and will be looking at opportunities for selling entire portfolios. He declined to discuss pricing or to specify which loans or properties would go on the block. "Theres no fire sale. There are no haircut sales. We sell at the prices that we expect in a way that increasingly allows us to close transactions," he said. Mr. Kranebitter acknowledged that the real-estate loans and investments were predominantly made from 2004 to 2007 by the bank as speculative bets that the real-estate market would continue to grow in value. Property values in most markets havent recovered to those levels. Many of the investments and loans "had an inherent speculative element which simply did not work out," he said. 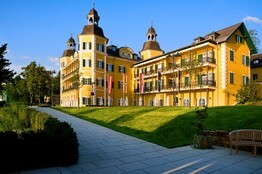 Schloss Velden, a luxury resort on Lake Woerth in Austria, has a spa, restaurant, beach club and marina. It also has 45 apartments, with 21 still for sale. The area is known for its casinos and provided the setting for a couple of popular German-language TV shows. The bank bought the hotel in 2004 from an individual and added a new wing with more rooms and a spa, plus some residential units. The investment was partly intended to help tourism in the area near the banks headquarters, says Christoph Harle, managing director of Jones Lang LaSalle Hotels. Hypo Alpe-Adrias sale of Schloss Velden comes as the Austrian property market is enjoying a period of relative stability, compared with other countries. According to Statistics Austria, a government agency, luxury-hotel overnight stays contracted only slightly in 2009 and grew 4.1% to 44.1 million in 2010. "The hotel itself is really lovely," Mr. Harle said. "Its a nice hotel. Its just a question of how are you going to make it work financially." Besides focusing on a new medical anti-aging spa concept, the new owners want "to enliven the wonderful place with artists, famous Italian football players, fashion and parties," Mr. Barchiesi says, adding that it is like Sleeping Beauty and needs to be woken up. Most of Hypo Alpe-Adrias real-estate holdings are in Croatia and Slovenia. According to a report by Jones Lang LaSalle on the Zagreb, Croatia, office market, demand remains weak because of the downturn. However, there has been a slight uptick in investments this year, as well as more interest from foreign investors expecting market conditions will improve when Croatia gains membership to the European Union, negotiations for which are expected to conclude this year.